I’m always honored to work with a repeat client because it means we did something right the last time. 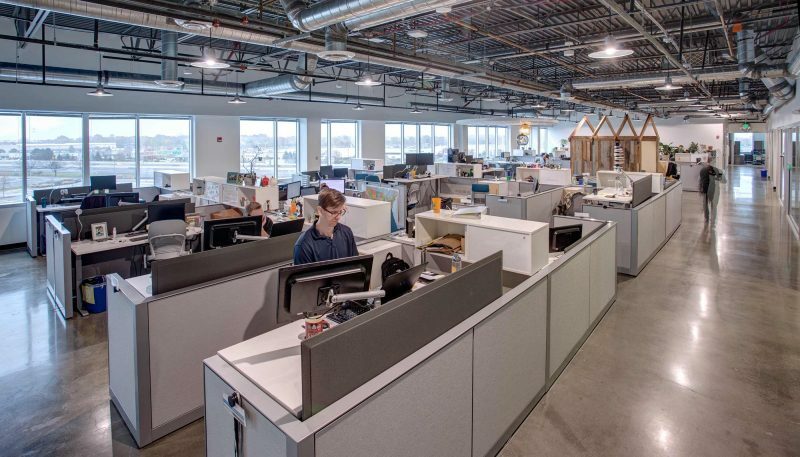 That’s exactly what brought third-time client, Heritage Environmental Services, back to Curran to transform an outdated, traditional office space into an open, collaborative work environment on the west side of Indianapolis. 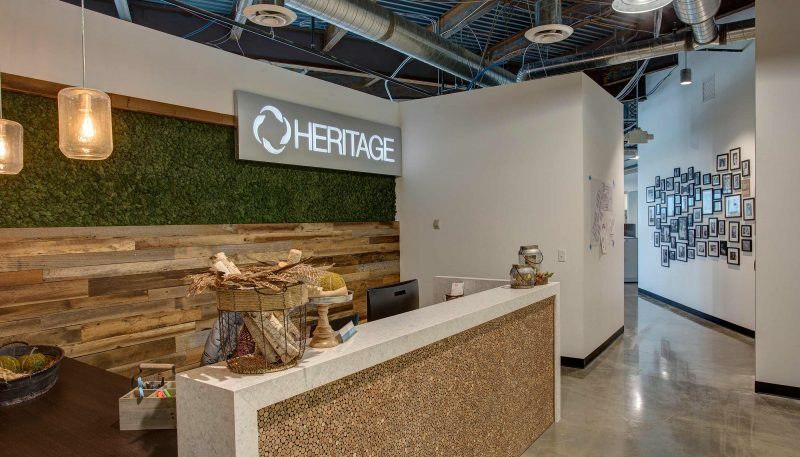 As an environmental company, Heritage wanted an office that reflected its brand and mission from the inside out. Exposing the raw materials of the building like concrete, ductwork, and open wiring created a gritty yet sophisticated industrial feel. Columns were left bare and unaltered, and Heritage embraced the imperfections of naturally-rusted design elements as an echo of their earthy brand and down-and-dirty work. Recycling and reusing items is core to what Heritage cares about and they’re living it out in their own space. As part of the remodel, the Heritage team recycled some Hoosier materials right back into their design. 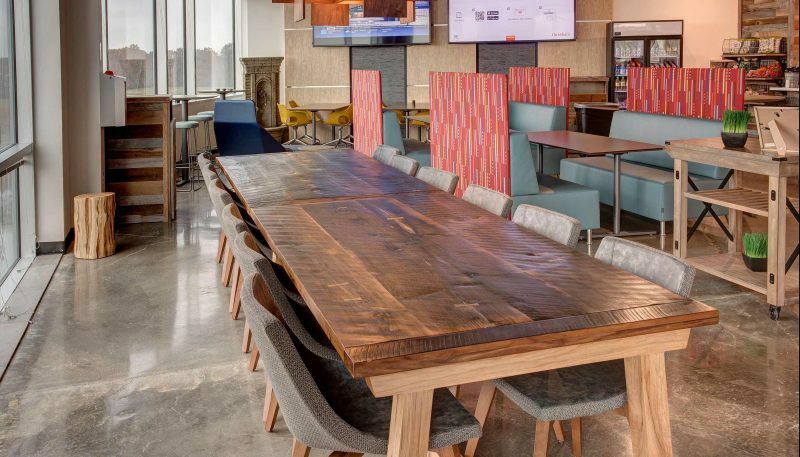 After taking down an old barn in southern Indiana, they salvaged the wood and made an eye-catching farm table for the employee break room. Also, to reduce the use of wasteful disposable cups, Heritage asked us to create a fun and functional wall where everyone could hang their own personal mugs. Each cup on the wall represents the individual employee’s tastes and creates an at-a-glance patchwork quilt of personalities. We gutted the existing mix of private and open offices, then designed work areas specific to Heritage’s need for collaboration. Smaller, glass-walled offices let team leaders and executives have privacy when needed, yet feel more open and connected to the rest of the team at all times. We also created collaboration spaces for stand-up meetings, allowing for shorter, more productive experiences. And casual, comfortable seating areas were installed to let employees relax, sit, read, and brainstorm their next big idea. One of the great qualities of Heritage is that caring about their employees is ingrained into their culture, so thoughtful amenities were critical in our designs. 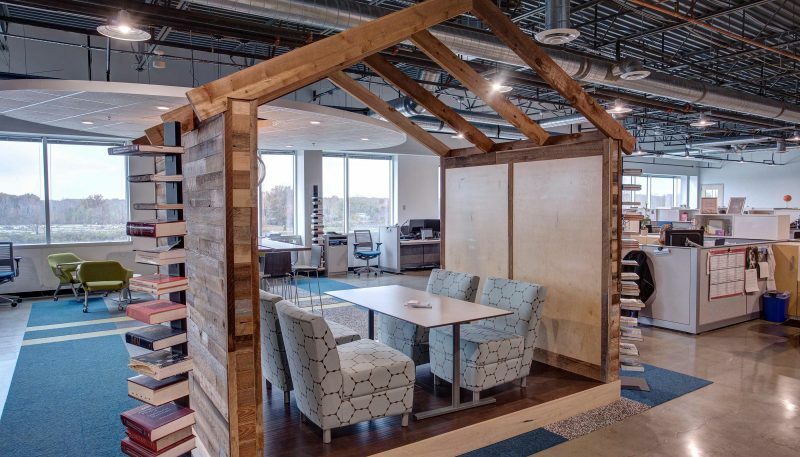 The workspace needed more than just functionality to reflect this desire. 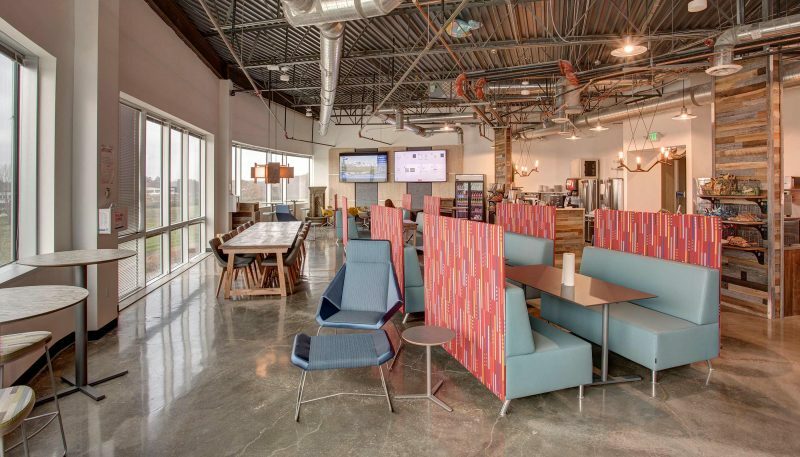 Lots of natural light and a top-notch, cozy break room give workers a soothing place to rest and socialize. 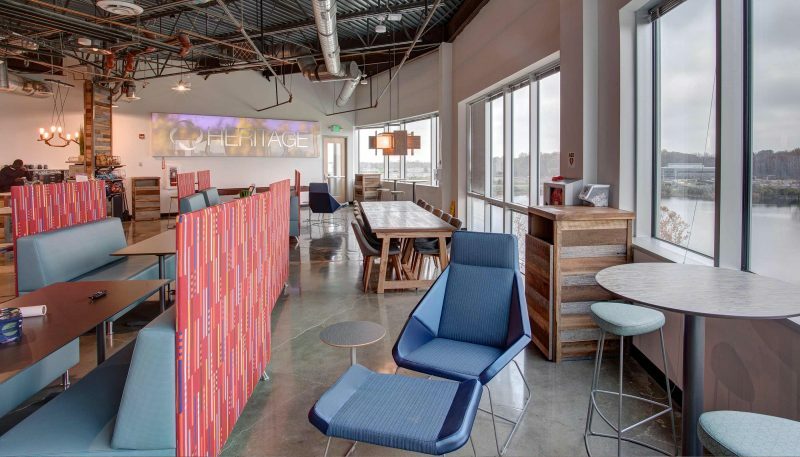 And employees also enjoy plush seating areas in addition to spacious and comfortable work spaces. Working with Heritage was smooth sailing and a lot of fun. Since the existing space was gutted, we tackled potential problems before they even became issues. And we enjoyed working with the natural building elements for the desired rustic, industrial look. They trusted our skilled team to do our jobs as architects and designers, and that’s a great joy and privilege.